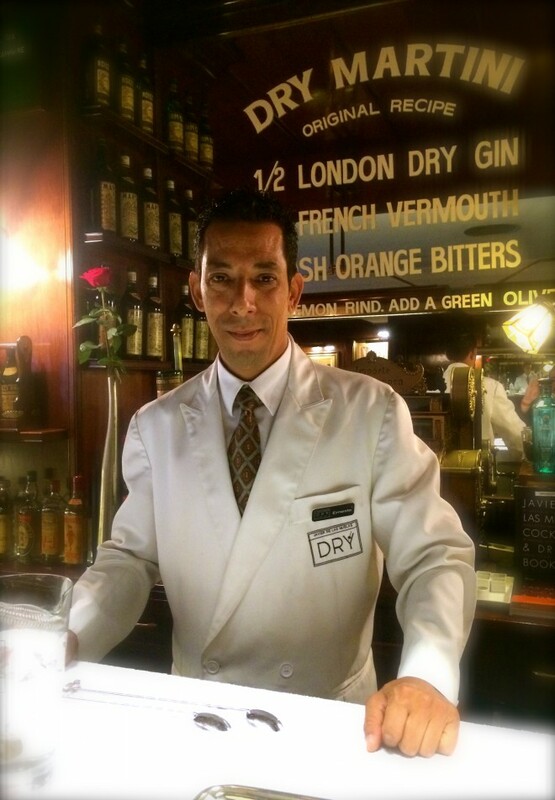 I’m Ernesto Guerra and I’m a bartender at Dry Martini in Barcelona. I was born in Cuba, grew up in Sweden, went to ballet school and was a professional dancer before I started bartending. I like to perform. I see the bar as a place you can create and perform too and I have been in this business for 20 years now. Working in a bar I can create something and instantly see if a customer is happy or not, just like during a performance. I usually say to the customer, if you don’t like my cocktail, I will drink it. My drinks must be ok as I’ve never had to drink one yet. Eventually I left Sweden for Barcelona, because I have relatives here and I wanted to improve myself. I was an expert about rum and wanted to learn more about wine. The course was half a block from Dry Martini, so it was natural for me to work here. It’s the first time I have stayed 7 years in the one place. I really like it. I improve my english all the time and continue to create on a daily basis. I like to mix things and that theme continues in the environment of the bar of my dreams. I love having wood and leather, like we do here because they remind me of cigars and brandy. At the same time I like the look of U.S milkshake bars from the 50’s. So my bar would have many small and different looking rooms, that would fit 25 people in each. The ambiance, cocktail lists and music would vary in relation to each room. I also think food is important, even if it’s only finger food, as it’s needed when you drink alcohol. I have two young kids, so it’s difficult to get out, but when I do, I visit my friends where they work in different types of bars. Rum of course. Because it’s sweet like liquid sugar, which warms me up and reminds me of dancing. When I think about rum, it reminds me of the Caribbean, palm trees and Sweden too. For many years in Sweden we managed a Cuban style bar, with two levels and a terrace. The idea was to sell rum and quality cigars in a country where they usually just drink vodka. It’s about the heart. Producing something that comes from you and that you have created. The product I want to talk about is of course our own Droplets collection. They are like bitters without bitterness or alcohol to strengthen the flavour. The company have designed 12 different flavours, from Meditterranean Rosemary to Oak Smoke. You can use them in anything from cocktails to a salad dressing. In London it would be Artesian, amazing place. Here in Barcelona Boada.